At the start of the fall semester, student members of Sycamore Blitz Promotions at Indiana State University created a street team to raise awareness of Terre Haute businesses. The team signed ISU students up for email blasts, which included coupons and free offers from local businesses to get the campus community involved. The Sycamore Blitz Promotions team creates a promotional blitz that last three weeks. The goal of the organization is to connect the ISU community with local businesses and in the process build a business strategy for these companies. This email blast set up a campaign for students to build upon. "Local businesses can profit especially from these medias when [they are] used in a way that generates interest among the clientele they are trying to reach," said Gabrielle Roach, a senior fine arts major from Terre Haute. J. Gumbo's is one of the businesses that the students worked with during a semester long media marketing project, said Nick Jones, a senior marketing major from Lexington. The student team put together a social media package for the restaurant, including a Twitter, Facebook, and newsletter blast sent out via email, said Jones. The Sycamore Blitz Promotions team also created a YouTube commercial to promote the restaurant. "By saturating the market of the ISU community this gets people enthused and interested in coming to get whatever services you have to provide," Jones said. 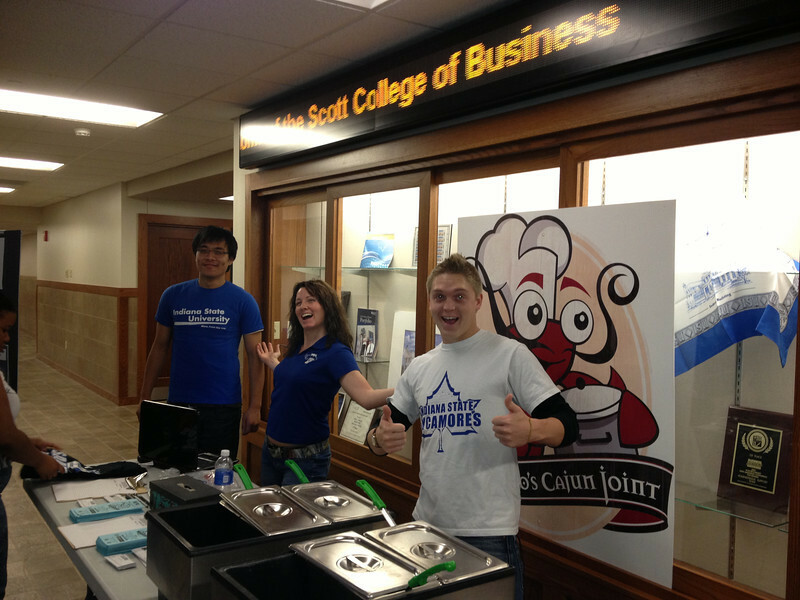 In Federal Hall, free J. Gumbo samples were offered to students. "There's a lot of business plan aspects when working with the restaurant and an organizational structure that we have to work on while we're doing promotional events." said Jones. "In regards to reaching a university-based market, social media forums are an important tool in advertising as our society becomes more and more technology reliant," Roach said. This semester the Sycamore Blitz Promotions team valued producing strategies for local businesses. "It has kind of been a process because we are seven to eight weeks into the semester; we basically had to take the business from the ground up," said Hudspeth. The group is the latest addition to Sycamore Student Ventures, a series of capstone experiential learning labs for senior business students to apply their class lessons in a real-world setting, said Art Sherwood, professor and co-director of Sycamore Student Ventures. Since Sycamore Blitz Promotions was so new, students had to run the business while also helping to define some of the organization's practices. The organization was test-piloted in spring 2011, before finally being implemented fully in the fall, Sherwood said. "To run courses like this, you have to think in multi-semester blocks of time, because one builds off the other, and that's strategy," he added. "So we try to push them and say ‘how can you set up the next group of students for success?'" The Statesman is delivered to over 90 locations on campus, and Sycamore Blitz Promotions partnered with them to create ads. The students eagerly look forward to building up a client base through social media. "We are really trying," said Tricia Hudspeth, a senior marketing major from Roachdale, "to strengthen that relationship between the ISU community and local businesses." 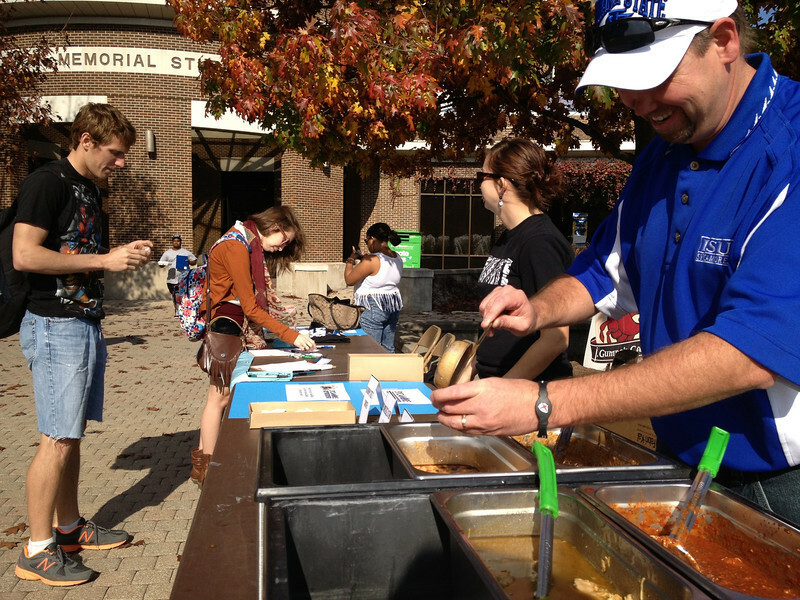 Photo: http://isuphoto.smugmug.com/Other/Media-Services/SyBA-for-Austin/i-NCx5fq9/0/L/Gumbos%20promo%20event%202-L.jpg (Submitted photo)Indiana State University students try food from J. Gumbo's restaurant in Terre Haute. A team of ISU students from Sycamore Blitz Promotions worked with the restaurant on several promotional initiatives, including social media outreach. Business students working with Sycamore Blitz Promotions create promotional campaigns, which can include on-campus events and social media activities, to generate interest in their clients' businesses.